These high end Tri Shorts features stretchable fabrics and a compressive fit provide you with total muscle support for swimming, riding, and running. LG's Tri Course Shorts are a top choice for competitive triathletes. Built-in temperature control comes from innovative coldblack® technology that'll keep you riding steady throughout the bike leg of your race without burning up. The Mobius Tri Short is compressive without excess tightness. We have taken the pattern of the Forza Trishort with 4 pockets, put a fleece (minimalist) pad in, then replaced the Forza Fabric with Mobius Comfort Compression fabric. 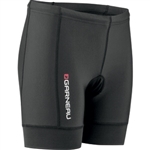 The result is a high performance compression tri short that is comfortable, not tight. The men's Performance Tri 9" Short continues to top the podium. Performance Endura+ fabric will keep you dry and comfortable so you can perform at your best. The upgraded Integra SBR 2D pad construction provides support where you need it most without the added bulk. The Riviera Trishort is a long distance short for the serious triathlete looking for performance, substantial padding, and a streamline compressive short. It features the new Mobius Comfort Compression Band and an integrated 7mm Clasico Pad. The Active Tri 8" Short delivers when it comes to performance. Constructed with Performance Endura+ fabric to help you stay dry and comfortable, and a new exclusive leg gripper provides targeted muscle support. The De Soto Forza Tri Short with 4-Pockets features the Forza-Fino Ceramico 4mm Pad with 4-Pockets, which makes it ideal for long and ultra distance racing. Premium triathlon engineering comes together in this G:2 Active Tri Short featuring 2XU’s 70D elastane SBR SKIN X for enhanced power, durability, moisture management and comfort. Feature Endura+ fabric and dual Hip Holster pockets for nutrition storage, The Zoot Men's Performance 6-inch Tri Short is a perfect training and race day short. For comfort and support the mens Performance 6" Tri Short is an awesome value. Upgraded with Teksheen BIOwrap hem that provides targeted muscle support for increased endurance, reduces damage caused by muscle vibration and eliminates leg gripper.